Have you ever wondered what would happen if Santa got stuck in a chimney? This story tells the story about how after many attempts by Zippy, Santa's Head Elf, to free them, they decided to call the fire department. A firefighter named Nathan came to Santa's rescue and plucked him out of the chimney. Santa then asked Nathan to accompany him and Zippy on the deliveries that Christmas Eve. And it was a good thing too. Nathan proved to be quite useful as they had a few more mishaps that evening that Nathan was able to help out with. Nathan proved to be Santa's Super Hero that evening. When Nathan was 3 1/2 years old, we went to our local CityTV Foodbank Friday. He was being interviewed on the air by the host, Dawn Chubai, when a fire truck pulled into the lane. Nathan was mesmerized by the fire truck. Then Dawn asked Nathan "what are firefighters?" Nathan replied, without a pause "My Super Heroes." That night, when I was telling him his bedtime story, Nathan asked me "What would happen if Santa got stuck in a chimney?" I asked him what he thought would happen and he started making up scenarios of how he could be rescued. We continued this for most of the month of December of 2009. Some of the scenarios that a 3 1/2 year old came up with were so cute i had to write them down. That way I could remember them for the next night. After Christmas we sat down with his ideas and turned them into a story. I told him our story every Christmas after that. 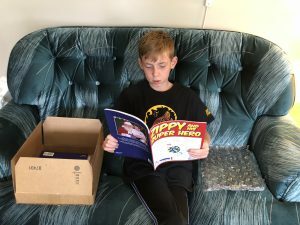 When he was 8 years old he asked me if we could turn our story into a book to share with others. And so our journey begins. 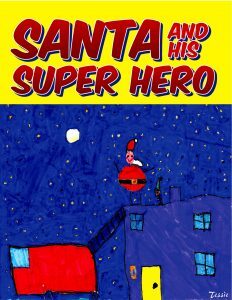 Get Your Copy of Santa and His Super Hero Today!